Group Study Exchange Team from South Africa Arrives! Over the month, clubs within District 6440 will host the visitors and arrange meetings between the international visitors and US professionals in similar vocations. The visitors also participate in cultural experiences, stay with Rotarian families and visit Rotary Club meetings. Tuesday, April 19, 6pm at D’Andreas Banquets, 4419 Route 14, Crystal Lake. Hosted by North West Sector. Friday, April 29, 3:30pm, at the Rotary District Conference, Lincolnshire Marriot Resort. 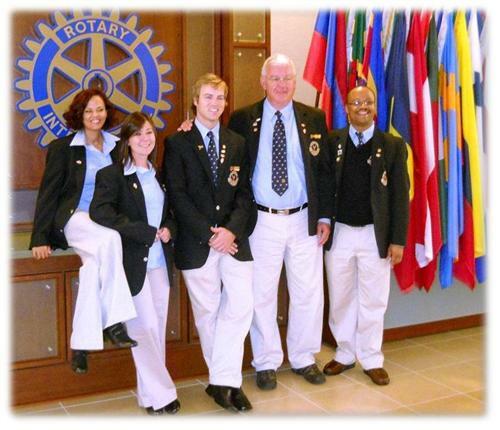 The Group Study Exchange is a vocational exchange between two Rotary Districts in different countries. Each year, District 6440, which is essentially Northern Illinois, selects a group of 4 young professionals under 40 who are not Rotarians and one Rotarian team leader who is over 40, to travel to another country for 4-6 weeks. Last year the “out bound” team visited South Africa and this next year the exchange will be with Taiwan. The sending district pays travel expenses while team members’ employers provide time off. Once the team arrives in the host country, the host clubs within the host district are assigned days to schedule meetings with professionals in their area, take part in cultural experiences, meet with Rotarians and stay with host Rotarian families. Persons interested in being a team member apply to their home Rotary District and the application/selection process is quite rigorous. Once selected, team members essentially make a year commitment, from the orientation process, the exchange and then visiting clubs in their home district describing their experience and how learning will be applied in their profession. The shared experience between hosts and teams is designed to be enriching on professional, personal, and cultural levels.